I-Thai Bubble Tea celebrates their one-year anniversary by offering a FREE small I-Thai Milk Tea with Bubbles to every customer from 1pm-5pm on June 8-10, and 50% off their newest offering, I-Thai Bingsu at 3003 M Street NW. WASHINGTON, DC, June 06, 2018 /24-7PressRelease/ — After providing guests with exceptional Thai cuisine and sushi for more than four years at I-Thai Restaurant and Sushi Bar, I-Thai Bubble Tea and Crêpe I-Thai has also proven to be a favorite destination for locals and tourists, located just off of M Street in Georgetown. 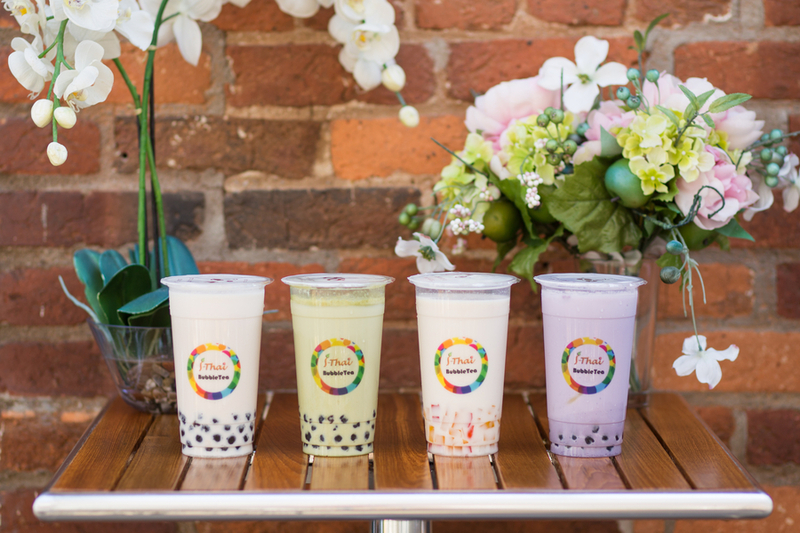 Celebrating the one-year anniversary since the opening of I-Thai Bubble Tea, the location will be offering a FREE small I-Thai Milk Tea with their famous Bubbles to each customer on June 8, 9 and 10 from 1pm to 5pm. During this promotion, guests can also experience I-Thai Bingsu with a 50% discount on all Bingsu desserts. The full I-Thai Bubble Tea menu is extensive, and includes the traditional Thai Iced Tea, Thai Ice Coffee and Lemon Thai Tea; Fruit Tea with Popping Bubbles; Ice Blended with Popping Bubbles; Milk Tea with the signature Tapioca Bubbles and other toppings; and Milk Ice Blended with the Tapioca Bubbles and other toppings. With the many variety of teas, toppings and bubbles, the flavor options are endless. I-Thai Bingsu has three delicious flavor offerings for the summer, which includes strawberry, mango and orange – each features fresh fruit, sauce and more Thai flavor toppings. Guests can easily access I-Thai Bubble Tea to enjoy Bubble Tea, Crêpes and Bingsu while on-the-go from the ground floor at 3003 M Street NW in Georgetown. I-Thai Restaurant and Sushi Bar is upstairs, where they offer a dynamic menu of traditional Thai dishes set among three distinct dining area, lounge and bar. The sunroom is always popular during the summer months, and with the high top tables and views over M Street, it is a perfect location to meet with friends and colleagues after work. Bubble Tea contains a tea base that is mixed with fruit or milk, and then completed with tapioca bubbles or fruit jelly. I-Thai Bubble Tea has been carefully developed with the highest quality ingredients to provide guests with a variety of flavor options. Fruit flavors include strawberry, mango, lychee, orange, green apple, peach and pomegranate; and the milk tea added flavors include tapioca bubbles, yogo jelly, aloe vera jelly, herbal jelly, coffee jelly and pudding. This delicious sweet treat has been a popular item throughout East Asia for many years, and now working with only the most authentic and high quality ingredients, the team at I-Thai is now offering this item to their customers. I-Thai Bingsu is a delicate combination of shaved ice with flavorful Thai milk that is then mixed with fresh fruit, sauce and other fun Thai toppings in a healthy sized bowl. Flavors available are mango, strawberry and orange, and I-Thai Bingsu is sure to be your new favorite summertime dessert. I-Thai Restaurant and Sushi Bar offers four regional cuisines that correspond with each of the four regions in Thailand: Northern, Northeastern, Central and Southern. Each dish is unique, as it elegantly balances three to four of the fundamental taste senses: sour, sweet, salty and bitter. The Sushi menu uses only the freshest ingredients, and is artfully prepared by the talented Sushi chefs. With a number of personalized options, the menu highlights fresh sushi, grilled seafood, vegetarian fares, and classically prepared Japanese dishes.